BBQ Sloppy Joe type of thing! So, “I swear, this has never happened to me before, I swear it…”, were the words that I spoke as I began making these burgers. I just stood there in shock as they began to fall appart right before my eyes. All that kept running through my head were the possible things that could have gone wrong during the preparation of these burgers. Did I not use enough egg, did I forget the breadcrumbs, did I not refrigerate the patties long enough, what could I have done wrong? I couldn’t wrap my head around why they just wouldn’t work for me this day. I was about to get discouraged and then I had a brilliant idea. 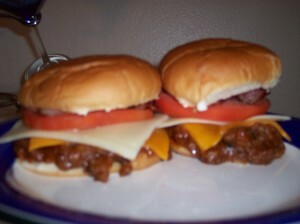 Since these burgers aren’t working anyway, let’s make some grilled BBQ sloppy joes, yeah, that’s the ticket. So, I continued to cook my crumbled beef and sausage on the grill until almost done…wait, wait, I’m getting ahead of myself, let me tell you the recipe and give some steps on how to make these amazing things. I mean, mix all of this stuff up until you can’t tell the difference between beef and sausage. Then take a ball of the meat mix (a ball that just fits in your palm) roll it around like you are making a meatball then patty it out. Keep doing this until you have made all of the burgers up. Place them in the fridge for about an hour to set. Now, for a little special tip, while the burgers are chillin, go ahead and fry up a pound of bacon. This was just the touch that these things needed. Ok, bacon is ready, burgers are chilled, grill has been started, and now it’s ready to cook. If you are lucky these burgers might not fall apart on you but for this recipe we kinda hope they do. Place them on the grill and don’t touch them again for a good 6-8 minutes. Try to turn them over once, we only want to try once because we don’t want them to be complete crumbles on the grill. I was able to not lose any of the meat between the grills. Cook this next side until almost completely done. And now comes the fun part. If you have a cast iron pot, put the meat from the grill, BBQ sauce and any other seasonings that you would like to the pot and place it back on the grill. Let this cook until it gets a nice boil and then put them on the buns. I topped these things with swiss and cheddar cheese, mayo, tomato, and the star of the show Bacon! My neighbors almost lost their minds when they tasted these little tasty treats and I couldn’t resist falling in love with them. Every once in a while it takes a mistake to create a genius dish and these will be perfected soon.